Ziptales – Making Reading FUN! Have you heard of Ziptales? Are you a parent with a child aged between 4 – 12 years? Do they enjoy reading or do they struggle? We have an exciting and fun way for your children to LOVE reading! The resource is called Ziptales, and consists of 500+ interactive online stories and activities designed to make reading fun. All of the e-Book stories include voice-overs (which you can switch on or off), animations, fun printable worksheets, games and much more. It’s a wonderful way to help any child struggling to read, or a great way to help extend children who are already reading well. Most importantly – it’s FREE! Log in to Ziptales online via www.ziptales.co.uk/library to get started and select Wokingham. You can access online from your local library, or at home (with your library card) via any device including computers, tablets and phones. Have you heard of Ziptales? Are you a parent with a child aged between 4 – 12 years? Do they enjoy reading? Or do they struggle? We have an exciting and fun way for your children to LOVE reading! The resource is called Ziptales, and consists of 500+ interactive online stories and activities designed to help make reading fun. All of the e-Book stories include voice overs (which you can switch on or off), animations, fun printable worksheets, games and much more. Log in to Ziptales online via www.ziptales.co.uk/library to get started and select Wokingham. You can access online from your Wokingham Borough Library, or at home (with your library card) via any device including computers, laptops, iPads and tablets. Are you are a parent with a child aged between 4 – 12 years? Do they enjoy reading? Or do they struggle? We are very excited to let you know that we now have available for all library members, an exciting and fun way for your children to LOVE reading! The resource is called Ziptales, and consists of 500+ interactive online stories and activities designed to help make reading fun. All of their stories include voice overs which you can turn on or off, comprehension exercises, fun printable worksheets to follow up with the stories, animations, games and much more. 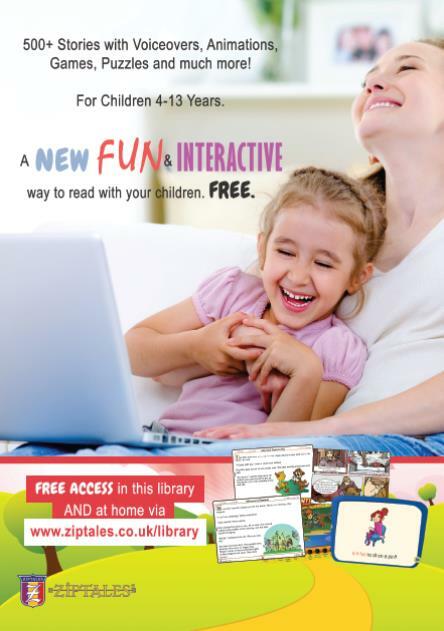 Just visit www.ziptales.co.uk/library and click on Wokingham Borough Libraries.